1001 fashion trends: Don't Get It Twisted! Rodarte also had the twist look going on for their spring show. I love how they paired their twists with some lovely little waves. So girly and romantic! At the Preen show, the twists looked so neat and precise. I love how it looked with the make-up, so pure and innocent. Preen definelty gave off that 40s look with their hair! Tired of boring braids? Then, try a twist! 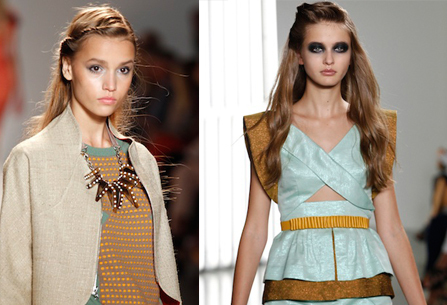 The twist is quickly becoming one of the biggest hair trends for 2012. They were all over the spring runways and have been popping up every among our favorite celebrities and models. Twists are just as versatile as braids because there are so many different, amazing ways to sport them. I love all the possibilities there are with the twist. I can't wait to see so many other ways it will be worn! I'm so curious to know if any of you guys will be trying out this new hair trend.